You and Tara become the excavators of your truths. She is the channel, the guide – encourager supreme. Her reading is still churning within me, but I know now what to do with that energy. The proverbial veil has been lifted (a little); there’s still so much work to do. I feel so lucky that I was able decide on some steps forward in my life thanks to Tara’s reading. She’s a gift. Tara effortlessly attunes to your energy through a thorough combination of technical analysis and qualifying questions. I found her communication skills to be of the highest caliber, delivering a very deep intuitive understanding to you from her perspective in words that are tailored to your specific place in your own journey. My reading resonated with truth, and Tara was right there with me on many areas that I thought were unique to my experience. 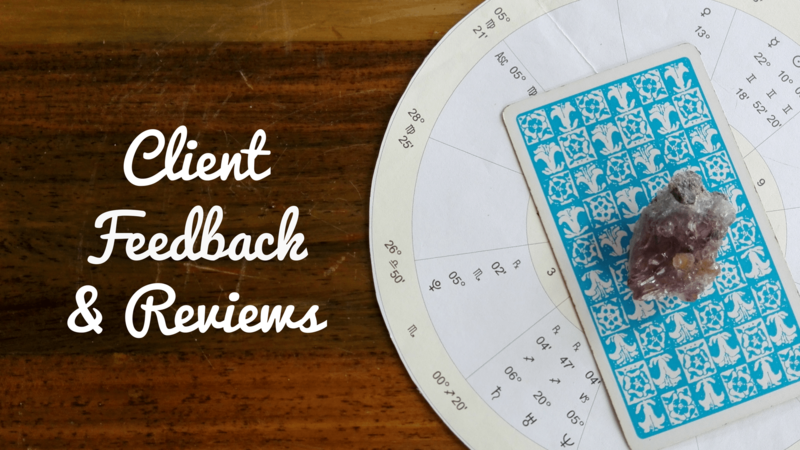 I wouldn’t hesitate to connect with Tara again and can highly recommend her to interpret and translate your astrological blueprint, and to support you. I super appreciate Tara’s delivery and low B-S approach to astrology and energy. To have a strong figure to give it to you straight is invaluable and exactly what I look for! Tara is a consummate professional and masterful astrologer. As a long time student of astrology, beginning to build my own practice, I chose to work with her through a teaching consultation, and I am beyond thrilled with my experience! I have followed Tara’s video blog for about a year and have continuously been in awe at the clarity, depth and nuance she brings to our craft. When I had the opportunity to meet with Tara for our 2 hour appointment, it was such a gift to find these qualities offered in spades. Through Tara’s empathic and thorough excavation of my own natal chart dynamics, I have come away with a much deeper understanding of and appreciation for the multidimensional energetics found within my own clients’ charts. Whether you are a serious student or practicing astrologer, I assure you that after the teaching consultation, you will begin to see the chart through a renewed set of eyes. There’s a living alchemy of intuitive insight and articulate, archetypal mastery in Tara’s approach. If you find yourself reading this, you are in the right place, this is the right time. I implore you to seek her counsel, as I will certainly return myself! My reading with Tara absolutely resonated with me. I found it extremely insightful. Tara was extremely thorough, leaving no stone unturned. She was extremely professional and asked many questions to personally unearth (no pun intended) the meaning of the transits and aspects instead of assuming her own ideology and symbols – something I find other astrologers doing frequently, which can give clients a very finite outcome to their potentials. Her work will help bring the study of astrology to a greater understanding and sensitivity. I enjoyed the experience and I recommend her highly!! She was extremely organized and generous with her time. It’s challenging to live an unease that one is incapable of understanding or describing. I’ve felt “off” for the past two years but as a respectable Capricorn, I pushed through. What a respite it was when Tara explained the planetary transits and progressions that were the “culprit” for my personal experiences. The reading and the reader resonated with me. Tara is personable, professional and encouraging. Her pre and post session care are impeccable and set the tone for working with her again. She is knowledgeable, caring and obviously hungry for more. Tara was able to tie my current experiences in all areas of life with a celestial schedule, this is encouraging me to stay the course. I absolutely recommend Tara, she is a lighthouse. I went to Tara after what felt like months of endless crisis after crisis, in hopes of gaining some clarity and direction. Tara certainly did not let me down. Her astrological reading was thorough, scarily accurate, and resonated with me deeply; I was left feeling understood and with a renewed sense of purpose. I hope to get more readings in the future, and have already recommended Tara to friends and family. My astrological reading with Tara deeply resonated with me and made me aware of patterns within me that I knew of but could not explain. I found it very fascinating and helpful how Tara put together the complex data derived from my chart into sentences that spoke straight to the heart of the matter. I found it extremely insightful and I tremendously enjoyed the experience. I would absolutely recommend Tara to anyone who is into astrology and related disciplines for a very thorough natal chart reading. I will return very soon. I had a great experience. Her astrological reading was extremely insightful and was able to answer and clarify so much and ease a lot of my anxieties throughout the session. The most helpful aspect of my reading was when she was able to show me the patterns and themes I never knew existed so strongly in my chart and how I can use what I’ve been feeling as my current “weaknesses” as my unique future strengths. I would recommend Tara to anyone seeking clarity and guidance. I will definitely be returning. Thank you Tara! I had my first consultation with Tara a little over a month ago. I was struggling with my emotions, feeling let down and lost, but I can say with 100% certainty that the guidance and absolute wonderful words of wisdom Tara shared with me have helped and are continuing to help guide me toward rebuilding my future. During our session I felt free to share the fears and anxieties I sometimes feel weary of sharing with people I communicate with on a daily basis in fear of being judged. There was no judgement from Tara – only understanding and words of encouragement. Because of Tara I feel a new sense of empowerment and trust in the universe, but most of all I feel a new strength when it comes to trusting my own gut instincts. She has a way of helping you shut out all the chatter life tries to throw in your ears so you can concentrate on your true emotions and your true destiny. I feel very thankful to have come across someone like Tara. I had the pleasure of having an astrology reading with Tara and was very pleased with her insights and expertise. I especially enjoyed learning about my north and south nodes and how the feelings I have been experiencing are tied to the nodes. I would recommend her to anyone who feels like they want to gain some expert perspective on their chart by a true professional. This was my first time getting an astrological reading done and Tara helped me navigate and understand my chart and current transits in a very practical and understandable way. We first spoke about my natal chart and went on to interpret past transits, current transits and progressions. What really resonated with me was being able to tie my life timeline and past events into specific astrological transits and progressions that were occurring at those specific times. This helped me gain a deeper and tangible understanding of how powerful astrology truly is. Tara took her time with me and encouraged me to ask any astrological questions once the session was complete. It was super helpful and I felt really comfortable. Because she knew I have a basic comprehension of astrology, she also encouraged me to participate in the reading as well by giving insight on how having specific placements played out in my chart. Overall, I had a great first experience and would definitely have another reading done in the near future. Tara went above and beyond and gave so much insight. Tara is very professional and organized, which made our time together flow smoothly. The reading itself was very informative – it resonated with me on many levels. Tara helped me to clarify areas of my life that have been causing a great deal of frustration. As we weaved through our 90 minutes together, the many insights I gained were invaluable, and I now feel a sense of peace and understanding on how to proceed on my life path. The most helpful aspect of the reading was showing me the way I am wired, and my soul signatures. This knowledge provided a roadmap to assist me in living my best life. I would definitely recommend Tara, and will certainly see her again, sooner rather than later. My reading with Tara absolutely resonated with me. The reading has answered a lot of my underlying questions and has, most of all given me the permission and power I needed to step into my own B-eing. I found it extremely insightful. It was very relaxed – like a conversation between souls. Especially because of my religious background, I was grateful that it didn’t feel too occult. I have always had a leaning toward exo-Christian practices and I had an opportunity to explore this without violating my own tenets of belief. The most helpful aspect of the reading was the outlined trajectory of the journey I am on. The precision with which it represented where I am now allowed me to trust the precision of the prognosticated future. I absolutely enjoyed the experience. Tara has a very genuine and open spirit that allows people to talk to her. Despite me feeling some of what Tara was going through, it did not block my ability to connect with her. In fact, it created such a commonality and harmony that I felt safe with her. Would I recommend her or return? Yes – I’m READY! I was much more authentic, powerful and self-assured this week because of Tara. I am grateful for her. Tara is a very intuitive reader, and the sessions reflect this intuitiveness. Unlike other readers who seem to pull names out of the air, which often bear no connection to the individual, Tara seeks to connect directly to you, and your individual issues. The session was very interactive, and allowed me to also make sense of the cards. I left with an uplifting feeling, a sense of empowerment and a clearer direction, knowing that real power lies in my hands. The readings are also very thorough, and Tara simply takes her time, allowing the cards to speak to the various issues. I thoroughly enjoyed the session, and definitely would make a booking for another. I really enjoyed my reading with Tara; it deeply resonated with me and some of my own intuitive insights were confirmed and expanded with new information. Tara is great at intuitively feeling the messages that are there for you, but she also combines them with down to earth and practical guidance. This was most helpful as it brought me understanding and clarity about specific actions I could take. I think Tara is great at distilling the essence of something, and would love to work further with her on a different reading of my astrology chart. I came across Tara quite by accident (if there is really such a thing). Having just gone through a spiritual awakening, I have lots of questions that I google daily! A blog post she had written answered one of such questions. What she had to say resonated with me immediately so I looked into her further! That’s when I discovered her website and the services she offers…quickly deciding to have her do my natal chart. Tara is gifted and thorough! I was extremely pleased with what I got from our lengthy session. Be assured that she does not disappoint with whatever assistance she gives, and I hope to work with her again very soon! Where do I even begin?? Well, with loads of gratitude for sure! WOW – you provided me with so much affirmation! And validated soooo many thoughts and feelings. It was so very helpful to be able to gaze at the cards while listening to your reading. The reading really helped me gain the confidence to listen to my own intuition and inner voice. It makes such a difference when you get an outside perspective to affirm what you already know inside. Everything you brought up was spot on and absolutely resonated with me on many levels. I have had my cards read for me several times over the years, and I must say this is one that stands among the most insightful. Prior to my reading with Tara I was in a rut as I was crippled with the fear of uncertainty and I struggled with making the right decisions for my life. I analysed and over-analysed the “what ifs” of my journey and though I knew my procrastination was unhealthy, I simply did not know how to move on from the series of “misfortunes” in my experience. Through my reading with Tara I have been empowered with life altering validation and I move forward with an admirable certainty about my life, knowing how to find my happiness and enjoy my prosperity. The most helpful resource my reading with Tara has given me is the foundation on which I can now rebuild my experience in a better way, and the anticipation of knowing my biggest accomplishments are truly ahead of me. I often listen to the recording of my session and Tara’s words resonate with me deeply. As they unfold they have proven to be accurate and exactly what I needed. Tara’s guidance on the specific areas such as career and love has been especially helpful, and for the first time in years I am now making tangible decisions that are proving to be the beginning of my new life with the renewed confidence Tara has given me. I would highly recommend Tara because everyone could use a little guidance on their path. Thank you Tara for the great work you are doing. The Universe is so timely and I must say that I am very happy I decided to do the reading with you. I feel as though I have evolved somehow since then. You are blessed with a great gift and I thank you for allowing me into your space. You have a lifetime customer. I will be back again as time goes on. Thank you for helping me with this breakthrough. I have been to Tara for two readings – and on each occasion they have been very insightful, and resonated with me so much. My sessions with Tara brought up perspectives I never thought of before. I started to think in a different way, and to look at my life in a different way. My sessions with Tara put me on a path. I was able to understand where I was headed, and the direction that I needed to head toward. It’s like you can “align” yourself with the reading, using it as your compass. It’s on point. My sessions with Tara have helped to give me a strong spiritual focus and direction, allowing me to become a better person. It is as if Tara is teacher-trained in her craft. She is articulate, and clear. Additionally, Tara sets the mood and the environment in a way that made me comfortable and put me completely at ease – no creepy stuff! I’m glad I took that step to go for a reading. Still marinating in my session with Tara Nikita yesterday, and all the astrological and intuitive insights. Let her help you dredge up clarity from your higher consciousness. It will re-arrange your path forward in all the best ways possible – trust me! The 1 hour and 20 minutes spent with Tara was the best and most enlightening 1 hour and 20 minutes I have had in my life for a long time as far as direction and guidance goes. The sessions are free and natural and help you to release. Every intuitive moment was worth the while. Every moment of pause and calm created ease and a freeing of my spirit; like the freeing of channels that I somehow never knew I had closed. An experience of gratitude. Thank you, Tara. May your gift be magnified always. I loved my reading from Tara! Her insights were thoughtful, clear and thorough. She addressed my questions by quickly getting at the root of the issue in a way that was illuminating, kind and empowering. I enjoyed how the messages were geared not to tell me what would happen to me but to help me decide for myself which direction to take. I’d suggest Tara to anyone seeking a tarot reading to open their perspective and the possibilities in life. My reading with Tara was my first experience of anything like this. I found it uncanny that specific cards came up in my reading that had so much relevance to my life. My reading with Tara was insightful – yes, there were things that I was already somewhat aware of, but my reading with Tara was not a run of the mill discussion. I received another perspective above and beyond what I already knew. Tara did not attempt to “read my life.” Choosing the cards myself reinforced that they came up because I invited those energies into my own life. In my reading with Tara the cards became a platform for discussion – prompting me to have a discussion with myself. I appreciated Tara’s empathy, objectivity, and her ability to listen. I received an objective read, which made the experience insightful. I appreciated the simplicity of her explanations, delivered in a way I could easily understand. During my session I thought Tara must do this a lot because she was able to connect the dots between different portions of my reading, and of my life – she made connections I would not have made. I booked a reading with Tara to inquire about two major areas of my life that I was feeling some ambivalence and uncertainty around. As I described the purpose of my visit, Tara asked thoughtful questions that not only informed the reading but also helped steer the conversation toward the core issues that were laying beneath my questions. As someone who prefers a direct and to-the-point approach, I really appreciated Tara’s ability to get right to the heart of my concerns. I was honestly blown away by the combination of Tara’s mastery with the cards and her obvious gift for intuitive knowing. Her ability to probe gently for more information when needed was a way of empowering me as the recipient of the reading; her questions actually facilitated the process of helping me access my own intuition and to verbalize what I was experiencing, which is something I’ve often struggled with. Between the cards and Tara’s way of facilitating a collaboration between our intuitions, we uncovered something that I’d known on a level for years but had never before been able to speak or consciously acknowledge. Overall, the reading was tremendously useful not only for the information it brought forth, but for the experience of tapping into my higher knowing. Very empowering. I would definitely recommend Tara to anyone interested in investigating the issues that challenge them in life. Tara not only helps you access new perspectives and information, but she actually shows you what it feels like to access your higher knowing. This is a priceless experience in my opinion, and something you can take with you long after the reading is done. Tara is the real deal. She reads the Tarot with passion, she delivers the messages with clarity and compassionate honesty. In addition to all of this, she is a professional and also approaches this sacred work from a place of professionalism and tremendous value. I was beyond pleased and satisfied with my time spent with her for a reading. That reading is so much what I needed to hear! Tara, thank you for taking the time, and the clarity of explaining the message that was meant for me. You are really accurate in regards to my being in my personal power, and building my solar plexus, and allowing the blessings of my hard work to just come into my life. I feel so much better. You are divine, a sister, and a teacher; such a blessing on this earth! My reading with Tara was awesome! Tara was very clear in her reading of the cards. Many things she said were so true, it was like she was in my mind. The terms and phrases she used proved to me that Spirit was there. I was honoured to touch Tara’s cards and put my intentions into them. The essential oils were soothing. I was at ease. Tara’s guidance was amazing and synchronized with all the videos I have watched and books I have read on the path of least resistance. I was blessed by our session and I would love to book another. I would recommend a session with Tara to anyone who needs answers. Before meeting Tara, Tarot was, for want of a better word, “spookiness” to me. However, after being present at a Q & A styled talk on the topic at which Tara was the presenter, Tarot was forever demystified in my mind. The first thing that struck me about her was she looked like the typical girl next door and nothing like the stereotypical Tarot reader – I confess I had bought into the image portrayed in the movies. Tara articulately explained how Tarot is used as a metaphysical and energetic tool for counselling and healing. As she further explained things like the relationship between tarot and psychic intuition, how the tarot could be used to understand the energetic foundation of our circumstance & how it can be used as a tool for insight and guidance, my interest in the Tarot was piqued. Being someone on the path self discovery I had no choice but to book a session with Tara to explore the Tarot which I had now become convinced would be a very helpful tool in further exploring my true self. Again, the session was like a sit down chit chat with the girl next door with special gifts as there was nothing unusual about the space in which it was held. Just in case I had any remnant hang-ups, Tara made the session seem like a natural occurrence. We took a look at 3 important areas of my life and by the time the session was over, I had a new found trust for my inner guidance as the readings revealed that which I was sensing intuitively. This perhaps was the main take-away from what I would say was an extremely insightful & enjoyable experience. I would recommend Tara at the drop of a hat. Several things came up not just in the cards, but in your reading of them that was so on the mark. What your reading is telling me is that I need to stop focusing on that salary and start focusing on my passion and purpose, the salary I need will come. Bottom line, your reading confirmed things I have already felt and known, but also gave me the instructions that I have been avoiding, which is that I’ve reached the point where I need to take action. I need to stop allowing fear of the changes to keep me in place. Your reading was very thorough and clear. Your way of connecting the cards together was very well done. Your reading was totally on the mark. I am so impressed with the accuracy of your reading, your professional commitment, and your sensitivity in understanding the importance of my situation. You have shown inherent intuitive insight by reading between the lines. Your reading is so true, and you have an ability to communicate with such diplomacy and connectivity at a one on one personal level. Your presentation style is exceptional – there is such ease of understanding and complete reading excellence! Thank you for your insightful reading and I found the recording most helpful. Each of the cards resonated with me, especially with the final card stating what direction I need to head towards. I had mixed emotions on the situation but your insight has given me the guidance I needed to make an informed decision that I was putting off but I knew needed to be made. Your reading was accurate in what I had assumed all along. Thank you for such a thorough and thoughtful reading. You really do have a wonderful gift! You did an amazing job of interpreting the cards and validated a number of situations and feelings. You answered my question and addressed my concerns while also giving me a feeling that there is a light at the end of the tunnel. I am so thankful to have a recording that I can refer back to that reminds me I am on the right path. Thank you for a clear, insightful reading. Everything you said made sense and this helped to clarify all my doubts. I have a better understanding of my situation now, as well as peace of mind. You have a great gift and I am grateful that you have shared it with me. First off I would like to say thank you so much for the reading. I liked that you recorded it as well, it helped me to really connect to you as a reader and trust the messages I am hearing versus reading it in an email. I think it is important as a reader to be able to build connection and rapport with your client, so hearing your voice really helped to align that connection and compassion you hold for your client. After listening to your reading it helped me to reaffirm and assess my past relationships and what I am looking for in the future. I also received support a few days later in how to get really clear on what I want and need in romantic partnerships. So I think the messages you gave me prepared and motivated me to take action in doing so and the timing was perfect. I also wanted to mention that I really like how you were very honest in your reading. You kept it simple and straight forward even when it did not seem like an ideal reading or a clear outcome. I think that the hardest part for readers is relaying the message (regardless of what it is) to the client in the best way for them to process for future growth/development. I think you have a great gift to share with others in regards to tarot and the metaphysical realms. First of all, let me tell you that I sincerely appreciate that you have done this reading for me. I wish I was able to let you know of this in person. I must say that I admire your work. You have provided me with a very insightful and accurate interpretation and I really liked that you have recorded it and given it to me in a mp3 file which of course I will be listening to again and again as I progress with this situation. As to the contents of the interpretation itself, I want to let you know that I find it accurate, it is in line with what has happened in my life, and it is also it is in line with many of the conclusions that I have come to after a year of experiencing this situation. I foresee that you will help a lot of people with your gifts. Tara, thank you for this very honest, very insightful, clear and detailed reading – I appreciate it very much. I found my reading from Tara very honest and direct to the questions and worries that I have in my life. She was pretty much spot on with everything that she had to say. I am thankful to have received this reading because it has given me the insight I need to move on with my life. Many thanks for my reading. It was exceptionally accurate and has given me great insight into my next move. It’s one of the best that I have ever had. You do really have a talent for the tarot cards. This was one of the best readings I’ve ever had. The detail and thoughtfulness in answering my questions through the tarot was amazing. The answer to my first question gave me hope and the answer to my second question gave me confirmation. Overall, I got a great sense of direction as far as what I need to work on inwardly. It was very insightful. Especially in the way that you inspired and encouraged me even through the negative aspects of the reading. I really enjoyed hearing about parts of myself I hadn’t considered. I was raised to know how to focus on myself and to be content with who I am as a person. Hearing that spoken about myself from a perfect stranger was very encouraging and exciting. It reminded me that it’s okay to be happy with me. And there’s nothing wrong with who I am. The most helpful aspect of the reading was the direction you gave concerning my environment (who is important in my journey and who is not). What made this a great reading was mostly the fact that you didn’t just tell me what the cards said (something a lot of readers do), you also gave guidance. Everything in this reading resonated with me. I appreciate this so much. Thank you. I was going to make a mistake but you have stopped me at the right time. Thanks for such an informative read …you were very good and kind. God be with you in helping others in need. Thank you very much for this reading. The reading has helped me to see how to proceed and search deeper within myself. It has made things a lot clearer. The way you put everything was very easy to understand. I am very pleased. This has been very good guidance for me. This is very useful and absolutely bang on. You are definitely one talented lady and clearly care about the clients you read for… Sending a voice reading instead of a typed one is an example of such a personal touch. I think you are innately gifted and bless you from the bottom of my heart. Spot on, spot on, spot on. I will definitely be consulting with you again. You care and are passionate. I am thrilled! I found the reading very, very accurate – especially in your description of me and my partner. The most important part of the reading for me was the call to action. It was the kind of information I need to step forward. Your advice to speak lovingly to the part of myself that is afraid resonated with me. When you said to speak to my fear as if it were a child, I was incredibly moved, and it was guidance I needed to control my doubts. Since your reading I was able to talk to my partner about my feelings and my fears, and it was beautiful. I feel ready to move forward with the relationship.